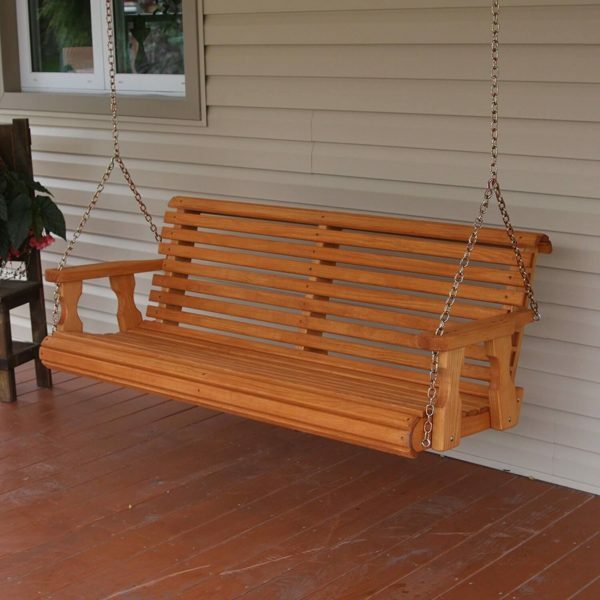 5 Natural Cedar Porch Swing with contoured seating and a natural designer look, this swing creates a vintage ambience and is perfect for a family of two. Read more about best porch swing reviews here.. The wood used, Western Red Cedar provides enough durability and longetivity due to its rot and insect resistant properties. It also makes the whole swing light in weight which provides ease of movement and comfort. 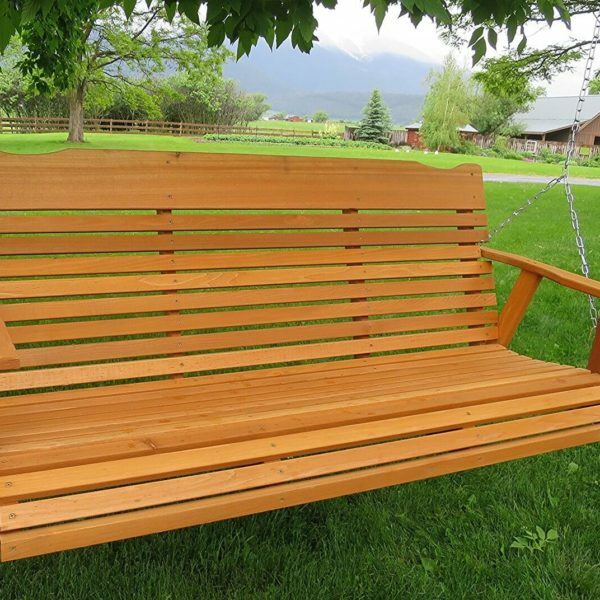 Build and construction: The 5’ Natural Cedar Porch Swing, Amish Crafted is made up of Western Red Cedar and as discussed above, the wood is completely rot resistant and insect proof. You have the freedom of applying a suitable finish to enhance its look and elongate its life durability but you can also leave it in its natural form to receive the same performance. It will only wear off in its color to form a grayish shade over time while the performance would remain intact. The assembly consists of chains and springs for an 8’porch ceiling. Weight capacity: It easily carries a weight capacity of 2 persons and the dimensions of the swing are approx. 23″ high x 62″ wide x 27″ deep. The seat of the swing measures 18” in depth and 58” in width. Comfort: The seating is designed with the concept of contours which gives the assembly a curved and sharp look. The contoured seating is extremely comfortable to sit on and the light weight of the swing enhances the seating experience. Durability: Western Cedar does not chip, warp or split easily and thus can stay intact for a long time. It is suitable to use in any weather and enhances the natural look of your porch or patio. You can however apply a finish instead of paint which would shield the swing from harmful UV rays. With comfortable contoured swing, light weight material and easy assembly, this swing also shows long term durability. Easily carrying a weight of two, this swing can highlight the décor of your outdoor space. The rustic look and the weather proof properties of the swing are other features to look up to.